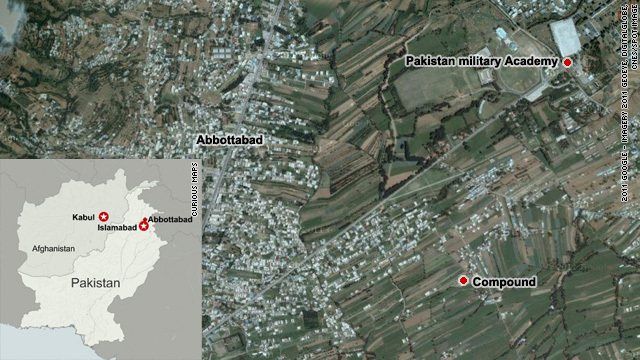 A map shows the compound and the city where Osama bin Laden was killed and its location to a Pakistan Military Academy. How did bin Laden hide just yards from Pakistan military academy? The compound where Osama bin Laden was killed by U.S. forces is located a bit more than 1,000 yards from a Pakistan Military Academy, raising some questions about how much information the Pakistan military may have had about his whereabouts. U.S. Sen. Carl Levin, Senate Armed Services Committee chairman, said during a press conference that the Pakistani army has "a lot of explaining to do." "I think the Pakistani army and intelligence have a lot of questions to answer, given the location, the length of time and the apparent fact that this facility was actually built for bin Laden and its closeness to the central location of the Pakistani army," Levin said. "So I think the army and the intelligence of Pakistan have plenty of questions that they should be answering and hopefully they are being asked by the Pakistani government." Abbottabad is home to Pakistan's equivalent of West Point - and the website of the Pakistani military even describes the PMA as "a short distance from Abbottabad" also noting "a fine straight road leads to PMA." Levin said while he appreciated some of the remarks made by President Asif Ali Zardari, he expected that he would have talks with the military about what they knew. "I do think that the Pakistani president's statement today was a very reassuring statement when he very specifically said that he thinks it is a great victory and that it's a success and he congratulates us on the success of the operation," he said. But although Levin said he was "not necessarily suspicious" that Zardari or civilian leadership knew, he added, "I must tell you I hope (Zardari) ... will follow through and ask some very tough questions of his own military and his own intelligence. They have got a lot of explaining to do." Since the war on terror began, we'd shared info with the pakis. W's idea. A year ago, we stopped. And got bin laden. Clearly, obama gets credit for catching him, and W gets credit for wasting time, money, and lives. no president obama does not get all the credit, during the bush adminstration is where the intelligence came from water broading one osamas Lutentients, soo bush made a damn good decusion on water broading these people becuse 6 yrs later obama had the chance to take him and he did. I only give credit for having a set of balls and giving the green light for the operation after that most of the intell came during the bush adminstration and acted 6yrs later!!! W likely knew where he was. Catching him would of not helped him line his buddy's pockets. I don't like your headlune at all. "bin Laden was killed by U.S. forces is located a bit more than 1,000 yards from a Pakistan Military Academy" This means he was 1 kilometer, not yards. How about a headline like, "How did bin Laden hide just one kilometer from Pakistan military academy?" Oh , now I see, it isn't very catchy is it. Orrrrr. Bin laden frozen body after the failed kidney transplant is put into house and kept on ice, Obama's ratings drop enough, thaw him out pop a bullet in his head with much ado in the night, and dump the body in the sea after getting some pictures and DNA.) Walllah instant vote base turn around and the war on terror is over, Troops come back and the peace prize can stay on the mantle. How do we really know bin Laden is dead? Maybe this is just a political stunt. If he wasn't, he'd have been on Al Jazeera already, wagging his finger. The building of Ladens Mansion began in 2001. Land owned by Major Aziz. Who is presently part of PAK army. Bin Laden moved in in 2005 or sooner. ISI and Pak Army Generals knew he was there. They aided and abeted him and Bush gave them money why so he could fight his foulish was in Iraq. No one would find the boggy man while the army is protecting him. He escaped during the Bora Bora evcuations why cause they let him escape. Bush belongs in the Hague with Chenney and Rummy. All the lives lost for what so Bushes money hungry war mongers could make more coin. Time to leave Afganistan our job is done. Stop wasting our money and lives of our men.. It time for Obama to resign the Roman ICC so Bush , chenney and Rummy can stand trial for crimes against humanity. We all know tthat Bush and Blair went to Iraq for oil. What good did it do. What are you paying now to fill your tank? There was never any WMDs. All the terrorist from 9-11 came from Saudi. Simply desire to say your article is as astounding. The clearness in your submit is just spectacular and that i can assume you are an expert on this subject. Fine with your permission allow me to grasp your feed to keep up to date with approaching post. Thank you one million and please keep up the rewarding work.